An Odyssey exclusive, our Glide Style consoles are made to house most front-loading style CD players like Pioneer's CDJ1000's and Denon's DN-S35000's. 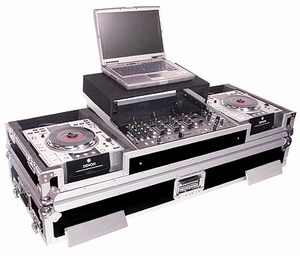 Above the mixer, a gliding laptop platform slides out on a unique rail system, which contains a 1U space below the platform which can house items such as a Rane Serato unit. This patent pending design locks into place away from the mixer area, leaving plenty of access for mixing. Includes wheels for easy tranport.